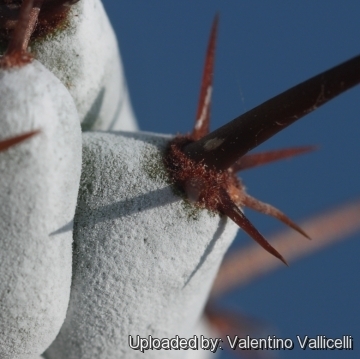 Accepted Scientific Name: Stenocereus beneckei (Ehrenb.) A.Berger & Buxb. Habitat: Grows on the sunniest parts of rocky cliffs. Stenocereus beneckei (Ehrenb.) A.Berger & Buxb. Stenocereus beneckei f. inermis hort. 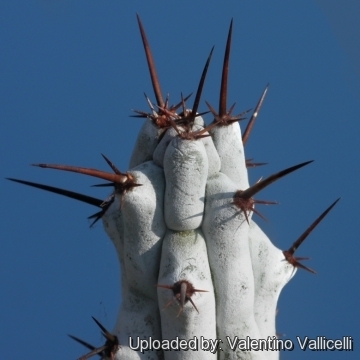 Description: Stenocereus beneckei is a shrubby, semi-prostrate columnar cactus with tuberculate ribs. It forms untidy, much branched bushes 1-2(-5) meters high. This plant has an attractive grey white bloom on the new growth. Stem: Erect or decumbent, bluish-green or bronze-green up 1-2 (or more) m long, 4-7 cm in diameter, the growing tips very glaucous with a powdery silvery-white waxy coating. Ribs: 5 to 9 strongly tuberculate, obtuse, separated by narrow intervals. Areoles: Small, circular, borne on the upper side of the tubercle, reddish-brown to black-felted 2- 5 cm apart. 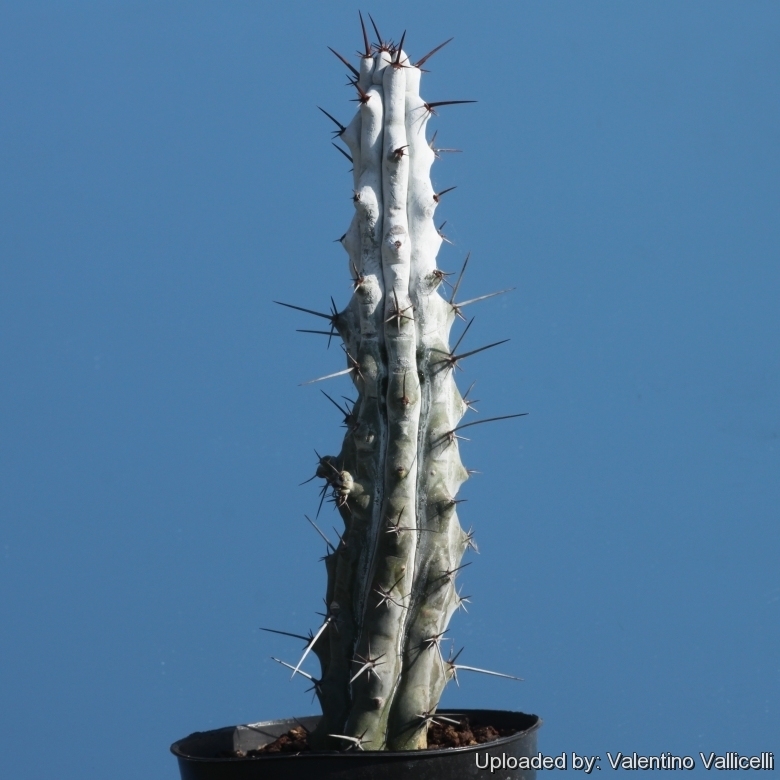 Spines: Usually 1 to 3 (rarely more), acicular, the uppermost central one longest sometimes up to 4 cm long, the lower 1-1,5 cm long, grey with reddish tips, brown or black at first. Spineless forms are also known. Flowers: Night-blooming, narrowly funnel-shaped, cream or greenish brown coloured , 4 cm long or more; inner perianth-segments rose-coloured to greenish-white; ovary globose, glaucous, tuberculate, with small felted areoles bearing 3 to 7 acicular spines or none. Blooming season: Winter, opening during the night and staying open 24 hours. Fruit: Less than 5 cm long, 2-3 cm wide, greyish-brown or reddish-brown, tuberculate bearing 8-9 spines per areole, up to 2 cm long; pericarp thick, somewhat fleshy; pulp disappearing, leaving the large seeds loose, these escaping by a basal pore as in Oreocereus and many of the Echinocactanae. Seed: Large (approx. 3,5 mm) shiny black. 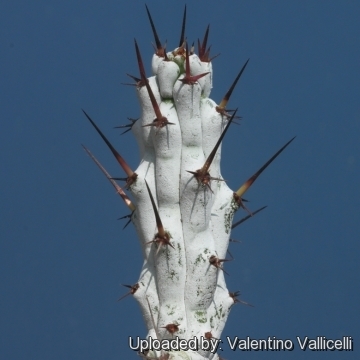 Note: The presence of a horizontal notch midway between areoles is a distinctive feature in Stenocereus beneckei, Stenocereus martinezii, Stenocereus quevedonis, and Stenocereus thurberi, but is absent in the remaining species of Stenocereus and other genera. Stenocereus beneckei (Ehrenb.) A.Berger & Buxb. : Shrubby, semi-prostrate columnar cactus with an attractive grey white bloom on the new growth. Stenocereus beneckei f. cristatus (P.V.Heath) P.V.Heath: Crested form. Stenocereus beneckei f. inermis hort. : Spineless form. 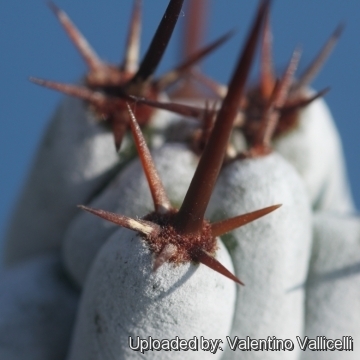 Cultivation and Propagation: Stenocereus beneckei is easy to grow but not very cold hardy (Resistant as low as -4°C for a short time). Hardiness: Reputedly sensitive to frost , but less so if kept on the dry side prior to, and during, cold weather (hardy to -4° C for short periods). However warmth throughout the year will increase the grower's success (8-12°C during rest season). During winter month, put them in a cool luminous place and encourage them to enter winter dormancy by withholding water and fertiliser over the winter as they will etiolate, or become thin, due to lower levels of light. Propagation: Division, direct sow after last frost. The seeds are quite easy to germinate and grow. Seeds germinate in 7-14 days at 21-27° C in spring, remove the glass cover gradually as the plants develops and keep ventilated, no full sun for young plants! To make a cutting twist off a branch and permit it to dry out a couple of weeks, lay it on the soil and insert the stem end partially into the soil. Try to keep the cutting somewhat upright so that the roots are able to grow downward.